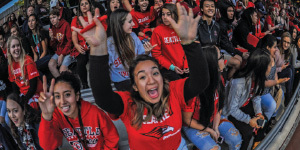 Seattle University has the largest transfer student population of any private college in Washington State, combining the resources of a vibrant, progressive, dynamic city with the benefits of a personalized education. • SU is also home to the nation’s first Environmental Engineering program and Software Engineering program. Alumni: Over 77,000 in all 50 states and 77 nations; they include attorneys, judges, physicians, nurses, diplomats, politicians, engineers, counselors, teachers, scientists, university deans and faculty, accountants, financiers, and corporate leaders. Seattle University leads the Pacific Northwest in the number of graduates awarded prestigious Truman and Wilson graduate scholarships and has produced two Rhodes Scholars. Transfer students are assured streamlined credit transfer in addition to individualized academic and career advising. In the center of a city known for its diversity, arts, business community, and spectacular mountain and water views, our students are able to fully engage in internships, clinical experiences, and research opportunities that pave the way for success after graduation. 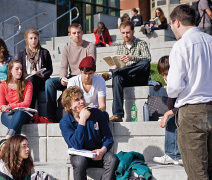 Essential to engaging the resources of Seattle is the strength of the on-campus experience. Class sizes are small—they average about 18 with a 13:1 student-faculty ratio—and professors are easily accessible and passionate about teaching. Professional undergraduate offerings include highly respected programs in Business, Nursing, Science, Engineering, and Liberal Arts such as Creative Writing, Social Work, Criminal Justice, and Journalism. The nationally recognized Transfer Collegia Program provides spacious, comfortably furnished centers that provide a place to study, meet with classmates and faculty, participate in special activities, or simply relax. Beyond academics, Seattle University provides a community that is diverse, engaged, and welcoming. Over 130 clubs and organizations and myriad activities, including intramural, club, and Division I athletics, keep students involved. As a Jesuit university, SU provides significant opportunities for leadership development and community service; three out of four students will have engaged in significant community service opportunities by the time they graduate. Beyond Seattle’s borders, students are encouraged to carry out the Jesuit commitment to global awareness through extensive education abroad opportunities in Africa, Asia, Europe, and Latin America. Seattle University has financial aid resources that make an SU education a worthwhile investment. Transfer merit scholarships are available in amounts up to $16,000 per year, and grant, work-study, and loan opportunities are also available. Tuition for 2017–2018 was $42,120, and in 2016, the average total financial aid offered to students was more than $28,000. Transfer applicants only need to submit an application for admission and the Free Application for Federal Student Aid (FAFSA) to be eligible for all institutional aid.